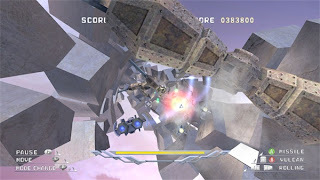 3D Infinity is a rail shooter that takes its pages right out of the Space Harrier book of gaming. 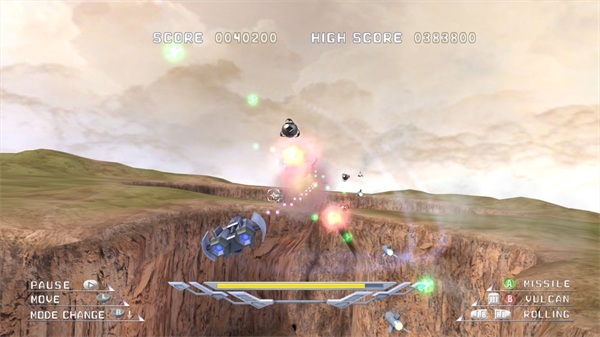 You're in a ship that looks almost exactly like Vader's from Episode IV and your goal is to fly across three different stages dodging enemies, bullets, and whatever terrain or obstacles pop up along the way. At the end of each stage, you'll find yourself at the normal stage-ending boss battle (same one in each stage) against a big floating robot with giant drills on its wings. The game's look is the main reason why I decided to review 3D Infinity in the first place. Even without the glasses, the first time I loaded the trial up I was pretty impressed with how everything looked. There's something to be said for how much a proper presentation can affect not only your decision to buy a game but also how much you enjoy your time with it, and 3D Infinity looks amazing. Put on the glasses, though, and you'll start weaving left and right to dodge doors, beams and cliffs like you're five years old and playing Mario Kart for the first time. Also, if someone's in the room, they'll laugh at you. A lot. On the downside of this, putting on the glasses makes the game look a little worse, as you're essentially looking through two tinted windows. Oddly enough, it also became a little more difficult to tell when a few things were going to hit my ship. The enemy bullets in particular seemed to creep up on me. When I took the glasses off I felt like I could see and dodge things a lot easier. As far as the music, there isn't anything incredibly special about it. It's well done, upbeat, and makes me want to watch the dogfight between Maverick and Jester in "Top Gun", but it's also somewhat generic and the fact that the same song plays through the entire game takes the enjoyment away pretty quickly. Sound effects, for the most part, consist of the sounds your ship makes and that's about it. The enemies make no noise whatsoever and, even if they did, it'd probably get drowned out by the constant noise of your missiles and machine guns firing off. Your controls, though basic, do provide a couple problems. On the upside, your machine gun can be fired with either RT or B, giving you a choice. On the downside, I'd rather one of these choices was A, which is reserved for your missiles. For some reason, holding RT and trying to hit LB or RB for the evasive barrel rolls doesn't feel natural. I'm sure that the lack of playing practically any FPS games might have something to do with that. Regardless, using B for the primary always on weapon feels borderline painful when trying to fire missile after missile with A. Everything else feels fine, aside from the fact that you just don't move fast enough to effectively dodge the terrain. This is pretty evident on your second time through when everything except you moves faster, and difficult dodges become nigh impossible even with the quick barrel rolls. And forget it if you need to dodge up or down on reaction because there isn't a quick evade option for that. I don't think it would've been possible for me to beat the game a second time through if it wasn't on Easy, and that's just because of all the stuff I ran into. Aside from the controls that really can't do what you need them to for that second playthrough, I felt like the game was nothing more than window dressing after the first stage. When I bought the game I was hoping for different enemies, a different boss, something interesting. Instead I got more of Stage 1 with a different order for dodging things. I will concede that it is VERY pretty window dressing and that's what drew me into the game in the first place, so that's probably my own fault. Still, if you play the one stage demo, you've essentially played the rest of the game minus the faster and more difficult second playthrough. Even the 3D effect wore out quickly, and my eyes started adjusting to the "trick" that the glasses played on them. And, finally, there's a certain feeling that you're just along for the ride. Nothing you do has any effect on the terrain, your flight path, or even the camera. You hit something, you take damage and your controller has a seizure in your hands but as far as the action there's literally no feedback. In a game designed for 3D immersion this makes you barely even feel like you're there. There's no leaderboard, no multiplayer, and no unlockable anything. So really, what you see in the first stage is what you get. I would be lying if I didn't say it was an awesome show in 3D for the little while that it lasted, but when that "little while" is a mere half hour tops I can't help but feel like it wasn't 400 MS Points well spent. Without the glasses, it isn't something I'd recommend at all. With them, well, you know what you're getting into by the end of the trial, and if that's worth the five bucks to you then by all means as it's an experience you won't find with any other game on the system, disc or not. 3D Infinity from SmileBoom is available on XBox Live for 400 MS Points. Played the game through twice with glasses and twice without, enjoyed the 3D while it lasted, and got laughed at by my girlfriend when I kept bobbing and weaving like I had a wasp up my bum.